The present NDA government led by the BJP at the Centre came to power in 2014 on the planks of development and anti-corruption. However, contrary to PM Narendra Modi's slogan of 'Na Khaunga, Na Khaane Doonga' (meaning ‘would not take bribes, nor would let anyone accept bribe’), a new report by the Delhi-based Centre for Media Studies (CMS) shows that almost three-fourth of Indian households think that the level of corruption in public services has either increased or remained the same during the last 12 months. But the CMS report has some good news in store, as well. 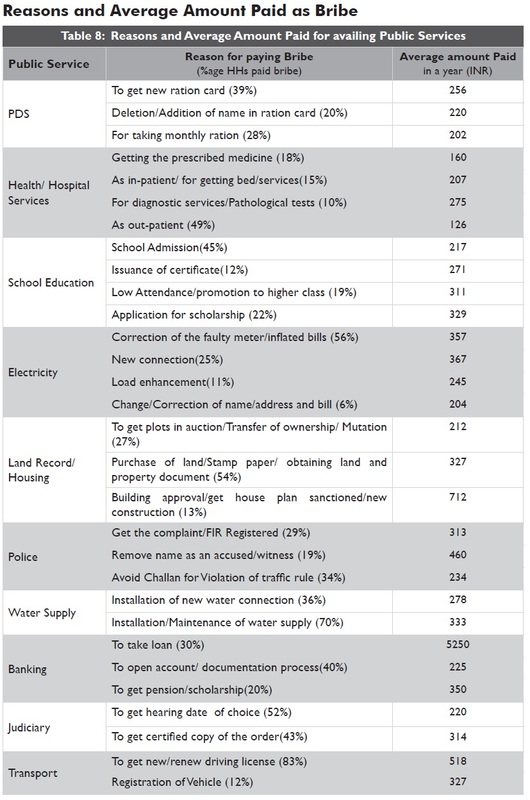 Based on a survey conducted in both rural and urban areas across 13 states, the recently released India Corruption Study 2018 has found that the proportion of households experiencing corruption while availing any of the nine public services has almost halved - from 52 percent in 2005 to 27 percent in 2018. The public services which have been availed between 2005 and 2018 are: Public Distribution System (PDS), Health/ Hospital, School Education, Electricity, Water Supply, Housing/ Land Records, Police, Banking Services and Judiciary. 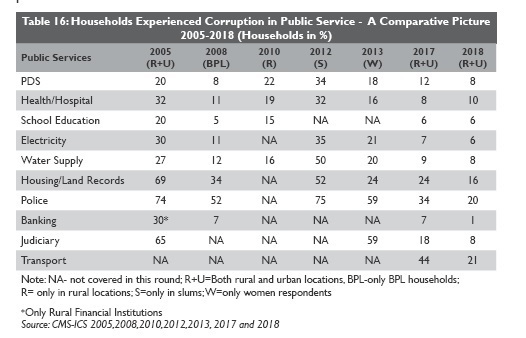 In the last 13 years, the proportion of households (rural and urban combined) experiencing corruption pertaining to Police, Housing/ Land Records and Judicial services has reduced by more than 50 percentage points, according to the recent report by CMS. 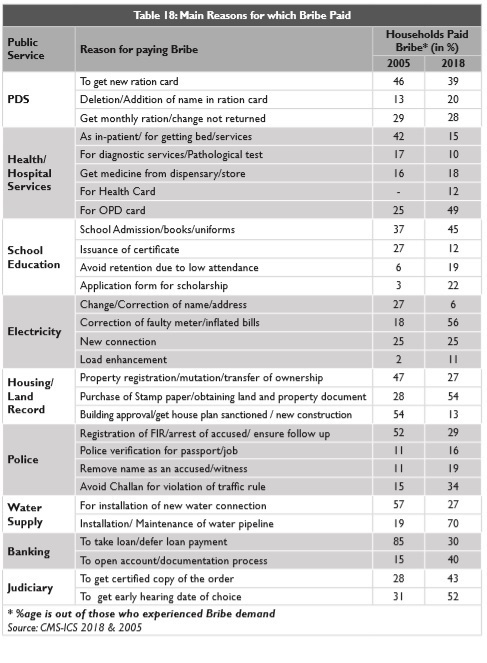 The proportion of households experiencing corruption in 2018 is the highest for Transport (21 percent), followed by Police (20 percent) and Housing/ Land Records (16 percent). Although the proportion of households experiencing corruption in 2018 is the lowest for availing Banking services (1 percent), the highest bribe which an average Indian household (almost 30 percent of such households who paid bribes in availing banking services) has paid in 2018 is for taking loans from a bank (viz. Rs. 5250/- on an average in last one year). For getting a new driving license or renewing a driving license, an average household has paid a bribe of Rs. 518 in a year. Please check interactive chart-1. 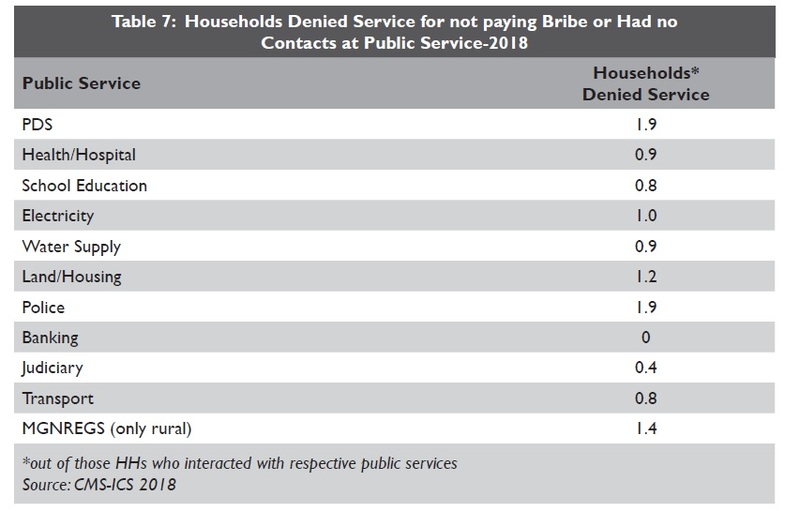 In 2018, roughly 1.9 percent households (rural and urban combined) were denied public services like Police or PDS either because of not paying bribes or because of not having contacts/ middlemen to take forward their requests. Nearly, 1.4 percent rural households were denied MGNREGA benefits for the same reasons. Please click here to access the key findings of the CMS-India Corruption Study 2018: 2015 to 2018-How well are states placed?